If you’re involved in a nature-related business such as camping, forestry, adventure sports, tourism, or conservation, our Dreamy Trees sticker design template is right for you. 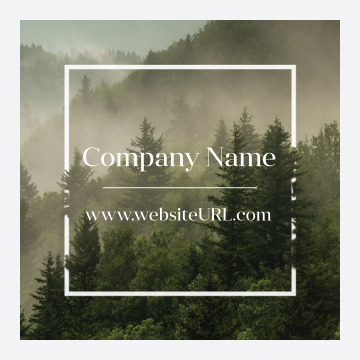 Featuring a breath-taking photograph of a pine forest in the mountains as the background, Dreamy Trees has ample space for your company name and website URL or other desired custom text in the middle field. Dreamy Trees is available in four different color options, two shapes, and three edge finishes. Impress your customers or clients by printing custom stickers with our easy-to-use online design tool today! All our sticker templates have been created by a professional designer and can be customized to match your business fast and easy with our online sticker design tool. Just choose your template and color scheme, then point-and-click your way to adding your custom text. And when you’re done designing you can download a free PDF to share with family, friends, and co-workers and get valuable feedback before you print your custom decals. You can count on affordable pricing and great value when you choose PsPrint as your online printing partner. High-quality printing at discount prices is our specialty. We use only premium paper stock with rich, vibrant, soy-based inks to bring your sticker to life. Plus, our customer satisfaction guarantee ensures that you’ll be thrilled with your finished stickers. Getting attention for your stickers is easy with PsPrint because we offer custom printing services that help you stand out above your competitors. Our foil stamping services add a bold, shiny design element while our die cutting services can deliver almost any shape you can think of for your sticker. Demonstrate how unique your business is with custom stickers from PsPrint!